Wasting Light (ინგლ. გამანადგურებელი ნათება) — ამერიკული როკ-ჯგუფ ჯგუფ Foo Fighters-ის მეშვიდე სტუდიური ალბომი, რომელიც გამოვიდა 2011 წელს. მასში დეივ გროლმა, ჯგუფის ლიდერმა, სცადა კოლექტივის ადრეული ნამუშევრების სტილის გამეორება და ციფრული ტექნოლოგიების უფრო ნაკლებად გამოყენება. ამისათვის ალბომი ჩაიწერა მის შინაურ სტუდიაში, ავტოფარეხში, კალიფორნიაში, მთლიანად ანალოგურ ტექნიკაზე. ალბომის პროდიუსერი არის ბუტჩ ვიგი. ვინაიდან ძველი ტექნიკა არ იძლეოდა შეცდომების შესწორების საშუალებას, ჯგუფმა სიმღერების რეპეტიციაში 3 კვირა გაატარა, ხოლო ვიგი კარგად ეცნობოდა მოძველებულ ტექნიკას. ჯგუფმა წინა ალბომებთან შედარებით უფრო მძიმე და უხეში ჟღერადობა გამოსცადა. ალბომის ტექსტები გროლმა დაუკავშირა საკუთარ ცხოვრებასა და შესაძლო მომავალს. ალბომის ჩაწერაში მონაწილეობდნენ დამატებითი მუსიკოსებიც - ბობ მოულდი, კრისტ ნოვოსელიჩი და ფი უეიბილი. ↑ 1.0 1.1 Thomas ერლეუაინი, Stephen. Wasting Light - Foo Fighters. Allmusic. წაკითხვის თარიღი: 2011-04-12. ↑ White Limo - Single by Foo Fighters - Single on iTunes. iTunes. წაკითხვის თარიღი: 09-04-12. ↑ Ryan, Kyle. (აპრილი 12, 2011) Foo Fighters: Wasting Light. The A.V. Club. წაკითხვის თარიღი: 2011-04-12. ↑ Petrusich, Amanda (მარტი 31, 2011). Wasting Light | Music | EW.com. Entertainment Weekly. Retrieved on 2011-04-13. ↑ Simpson, Dave (აპრილი 7, 2011). Foo Fighters: Wasting Light – review | Music | The Guardian. The Guardian. Retrieved on 2011-04-13. ↑ Parker, Rob. (აპრილი 6, 2011) Album Review: Foo Fighters - Wasting Light (Roswell/RCA). NME. წაკითხვის თარიღი: 2011-04-12. ↑ Bevan, David. (აპრილი 15, 2011) Pitchfork: Album Reviews: Foo Fighters: Wasting Light. Pitchfork Media. წაკითხვის თარიღი: 2011-04-15. ↑ Brannigan, პოლ (მაისი 2011). "Foo Fighters – Wasting Light (Roswell/RCA)". Q (Bauer Media Group) (298): 114–118. http://www.fooarchive.com/pics/news/Q_wl_review.jpg. წაკითხვის თარიღი: 2011-04-13. ↑ Liedel, Kevin. 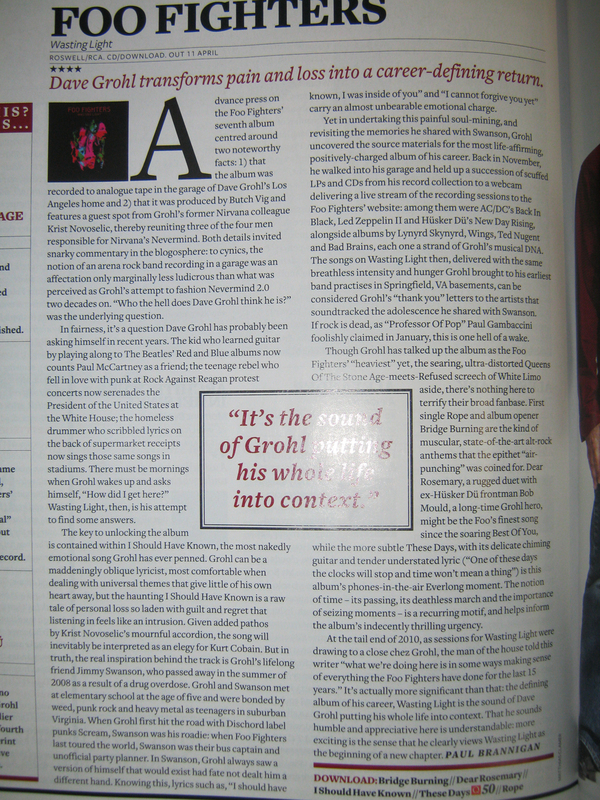 (აპრილი 13, 2011) Foo Fighters: Wasting Light Music Review. Slant Magazine. წაკითხვის თარიღი: 2011-04-13. ↑ Wood, Mikael. (აპრილი 8, 2011) Foo Fighters, 'Wasting Light' (Roswell/RCA). Spin. წაკითხვის თარიღი: 2011-04-12. ↑ Foo Fighters "Wasting Light" @ CDJapan. CDJapan.co.jp. წაკითხვის თარიღი: 2012-03-13. ↑ Foo Fighters "Wasting Light (Deluxe Version)" @ iTunes. iTunes. წაკითხვის თარიღი: 2012-03-13. ↑ "Foo Fighters – Wasting Light". Australiancharts.com. Hung Medien. წაკითხვის თარიღი ივნისი 26, 2016. ↑ "Foo Fighters - Wasting Light" (გერმანულად). Austriancharts.at. Hung Medien. წაკითხვის თარიღი ივნისი 26, 2016. ↑ "Foo Fighters – Wasting Light" (ჰოლანდიურად). Ultratop.be. Hung Medien. წაკითხვის თარიღი ივნისი 26, 2016. ↑ "Foo Fighters – Wasting Light" (ფრანგულად). Ultratop.be. Hung Medien. წაკითხვის თარიღი ივნისი 26, 2016. ↑ ČNS IFPI Czech. Hitparáda - TOP50 Prodejní. IFPI Czech Republic. წაკითხვის თარიღი: აპრილი 20, 2011. ↑ "Foo Fighters – Wasting Light". Danishcharts.com. Hung Medien. წაკითხვის თარიღი ივნისი 26, 2016. ↑ "Foo Fighters – Wasting Light" (ჰოლანდიურად). Dutchcharts.nl. Hung Medien. წაკითხვის თარიღი ივნისი 26, 2016. ↑ "Foo Fighters: Wasting Light" (ფინურად). Musiikkituottajat – IFPI ფინეთი. წაკითხვის თარიღი ივნისი 26, 2016. ↑ "Foo Fighters – Wasting Light". Lescharts.com. Hung Medien. წაკითხვის თარიღი ივნისი 26, 2016. ↑ "Foo Fighters – Wasting Light". Greekcharts.com. Hung Medien. წაკითხვის თარიღი ივნისი 26, 2016. ↑ Chart Track. ირლანდიის ალბომების ჩარტი. GfK. წაკითხვის თარიღი: აპრილი 15, 2011. ↑ "Foo Fighters – Wasting Light". Italiancharts.com. Hung Medien. წაკითხვის თარიღი ივნისი 26, 2016. ↑ Japanese Album Charts: Week 1, მაისი 2011 იაპონურად. Oricon. ციტატა: „9 ウェイスティング・ライト フー・ファイターズ 04/20 13085“ წაკითხვის თარიღი: იანვარი 15, 2012. ↑ Foo Fighters – Wasting Light იაპონურად. oricon ME inc.. წაკითხვის თარიღი: 2015-05-25. ↑ "Foo Fighters – Wasting Light". Mexicancharts.com. Hung Medien. წაკითხვის თარიღი ივნისი 26, 2016. ↑ "Foo Fighters – Wasting Light". Charts.org.nz. Hung Medien. წაკითხვის თარიღი ივნისი 26, 2016. ↑ "Foo Fighters – Wasting Light". Norwegiancharts.com. Hung Medien. წაკითხვის თარიღი ივნისი 26, 2016. ↑ "Oficjalna lista sprzedaży :: OLIS - Official Retail Sales Chart". OLiS. პოლონეთის აუდიოს და ვიდეოს მწარმოებლები. წაკითხვის თარიღი დეკემბერი 11, 2013. ↑ "Foo Fighters – Wasting Light". Portuguesecharts.com. Hung Medien. წაკითხვის თარიღი ივნისი 26, 2016. ↑ "Foo Fighters – Wasting Light". Spanishcharts.com. Hung Medien. წაკითხვის თარიღი ივნისი 26, 2016. ↑ "Foo Fighters – Wasting Light". Swedishcharts.com. Hung Medien. წაკითხვის თარიღი ივნისი 26, 2016. ↑ "Foo Fighters – Wasting Light". Swisscharts.com. Hung Medien. წაკითხვის თარიღი ივნისი 26, 2016. ↑ Ö3 Austria Top 40 - Longplay Charts 2011. Hitradio Ö3. დაარქივებულია ორიგინალიდან - 2012-01-04. წაკითხვის თარიღი: 2012-01-15. ↑ ARIA 2011 TOP 100 ALBUMS CHART (PDF). ARIA (2012-01-01). წაკითხვის თარიღი: 2012-01-06. ↑ 2011 Year End Charts: Top კანადის ალბომები. Billboard. წაკითხვის თარიღი: 2012-01-15. ↑ Album-Top 100. Hitlisten. IFPI Danmark & Nielsen Music Control. დაარქივებულია ორიგინალიდან - 2012-01-23. ↑ Album Jahrescharts 2011. MTV Germany. დაარქივებულია ორიგინალიდან - 2012-01-12. წაკითხვის თარიღი: 2012-01-15. ↑ Looking back at a musical mixed bag. Stuff.co.nz (2011-12-16). წაკითხვის თარიღი: 2012-01-15. ↑ Schweizer Jahreshitparade 2011 გერმანული. Swiss Hitparade (Hung Medien). დაარქივებულია ორიგინალიდან - 2013-08-15. წაკითხვის თარიღი: 2012-01-15. ↑ Billboard 200 Year-End 2011. Billboard. წაკითხვის თარიღი: 2012-05-04. ↑ ARIA Top 100 Albums 2012. ARIA. წაკითხვის თარიღი: 2015-01-15. ↑ NZ Top 40 Selling Albums 2012. RIANZ. დაარქივებულია ორიგინალიდან - სექტემბერი 13, 2014. წაკითხვის თარიღი: 2015-01-15. ↑ Canadian album certifications – Foo Fighters – Wasting Light. Music Canada. ↑ 54.0 54.1 Finnish album certifications – Foo Fighters – Wasting Light ფინურად. Musiikkituottajat – IFPI Finland. ↑ ოქროს/პლატინის მონაცემთა ბაზა (Foo Fighters; 'Wasting Light') გერმანულად. ფედერალური მუსიკალური ინდუსტრიის ასოციაცია. ↑ Irish Certifications - Gold - 2011 irishcharts.ie. Retrieved ივნისი 25, 2016. ↑ Italian album certifications – Foo Fighters – Wasting Light იტალიურად (PDF). იტალიის მუსიკალური ინდუსტრიის ფედერაცია. ↑ Gouden plaat voor Foo Fighters Dutch. 3FM (აგვისტო 19, 2012). დაარქივებულია ორიგინალიდან - ნოემბერი 27, 2012. წაკითხვის თარიღი: ნოემბერი 27, 2012. ↑ CHART 1784 01 აგვისტო 2011 (PDF). RIANZ. წაკითხვის თარიღი: 2011-05-17. ↑ BPI: Certified Awards Search. ბრიტანეთის ფონოგრამების მწარმოებლების ასოციაცია (BPI). წაკითხვის თარიღი: ივნისი 25, 2016. ↑ Rock Lives (Still): Mumford & Sons, Foster The People Lead 2011's Growing Rock Retail billboard.com. Retrieved იანვარი 20, 2016.